Town Hall Meeting at 6:00 PM on Thursday, Feb. 16 at Trinity Presbyterian Church, 1728 S. Hull St.
With the recent break-ins in Hillwood and other Midtown neighborhoods, I had planned on calling a meeting of all interested parties sometime this month to discuss what actions we can take to stem this recent wave. In the interim, however, a group of concerned neighbors from several Midtown neighborhood associations have organized a Town Hall Meeting at 6:00 PM on Thursday, Feb. 16 at Trinity Presbyterian Church, 1728 S. Hull St. to discuss the recent rash of crime that has threatened most of Midtown. Chief Finley and Councilman Arch Lee will be in attendance so this is an opportunity to discuss with our representatives and officials our concerns in a positive and constructive manner. Please make every effort to attend this important meeting and please respond to this post if you are planning on attending. Depending on the fruitfulness of this meeting, we may or may not call a follow-up meeting of the Hillwood HOA to discuss what actions we can take to eliminate crime from Hillwood. Like all other Midtown neighborhoods, these events seem to come in waves. We want to stay on top of this so your suggestions as to what we can do, would be appreciated. We’ve looked at reinitiating a paid patrol company, paying for off-duty police patrol, installing cameras, eliminating some entrances to Hillwood, etc. Each has advantages and disadvantages but there may be some idea that has not yet occurred to us that someone may bring to the table so please feel free to offer your suggestions. I hope to see you at Trinity Church on Thursday Feb 16 at 6:00PM. Hollons (Shoreham) plan to attend! 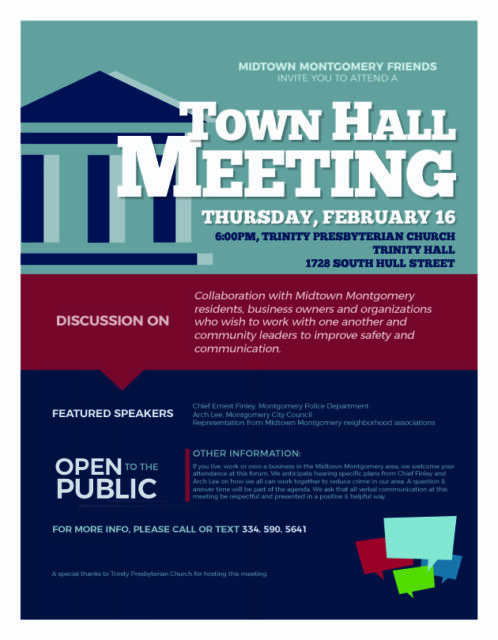 Please don’t forget the Town Hall Meeting at 6:00 PM this Thursday, Feb. 16 at Trinity Presbyterian Church, 1728 S. Hull St. to discuss the recent rash of crime that has threatened most of Midtown. Chief Finley and Councilman Arch Lee will be in attendance so this is an opportunity to discuss with our representatives and officials our concerns in a positive and constructive manner. Please make every effort to attend this important meeting.